Around the world, energy producers are looking for the most reliable and efficient means for generating renewable energy through sustainable practices. Turbines using water currents to power communities is one of these methods. The problem: deciding where and how to place turbines to generate power while limiting their effect on the surrounding environments. That's where Lauren Ross' computer model comes in. Ross is an assistant professor in the College of Engineering at the University of Maine. She previously worked with other researchers and engineers at the University of Bordeaux, studying tidal turbines in an estuary system on the southwest coast of France. That postdoc research has carried over to her current project, "Understanding the impact of tidal turbines on current velocity and sediment transport in a macrotidal estuary: a numerical model study." The project involves inputting numerical data into a 3-D computer model. 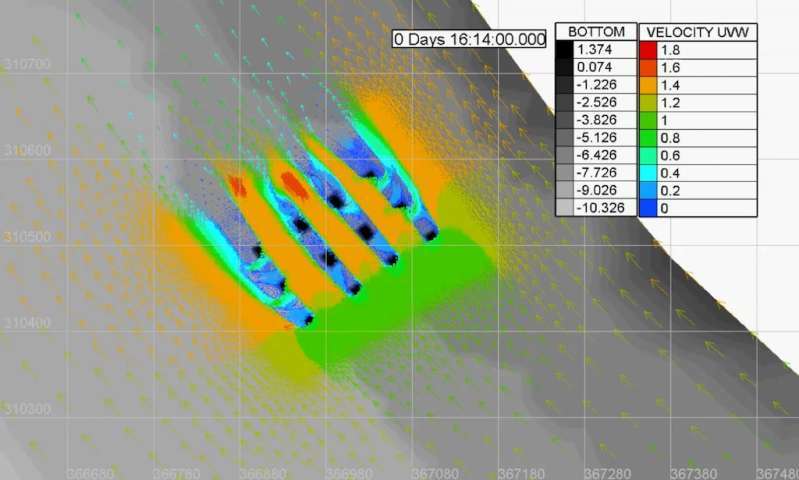 The model can simulate the effects of placing power-generating turbines in waterways that experience tides. Tidal turbines are rotating blades propelled by flowing currents of water that create energy. They are used in estuaries, or places where rivers meet the tide. This is an ideal location for energy-producing equipment because of the reliable daily tides and the ability to estimate the amount of electricity to be generated at a given time. Tidal turbines are housed in fixed structures and placed in the water. It takes multiple turbines, considered a turbine "farm," to generate enough electricity to power a substantial portion of a community. While tidal turbines are not as large as their wind turbine cousins, they can impact the physical and social aspects of estuary communities. Before placing a tidal turbine "farm" in a waterway, Ross' model can simulate the impact and benefits of the geographic location of the farm and the most efficient way to arrange the turbines. This saves energy-producers the time and financial cost of trial and error in the field. "Companies want to understand the impact of the turbines on the environment," said Ross. "I realized there hadn't been many studies on both optimizing the configuration and seeing how that optimal configuration would affect environmental conditions." Before choosing a test location, turbine farmers must take into consideration the need to avoid busy boat traffic lanes, areas containing floating debris, the proximity of the farm to an electric grid, and the width of the geographic location to determine if a farm would fit. Once a location is chosen, Ross' computer model simulates the conditions of the estuary and helps determine where to locate and arrange an entire turbine field. The goal is to have all the turbines in a field receiving effective water flow. The model shows locations in an estuary that have the ideal flow of water to create the velocity needed to generate electricity. By using the drag coefficient of a turbine, the model measures the energy that the turbine extracts from the flow field throughout the tidal cycle. "I could help decision-makers determine the optimal configuration for the turbines with this model," said Ross. "Specifically, I could say 'If you can implement the turbines this way, you'll generate 'x' amount of electricity.'" Knowing the impact a turbine farm will have on the surrounding environment is important. The physical presence of the turbines themselves could slow the flow of the water in the channel and increase the amount of sediment deposition and accumulation. Ross' model simulates this impact. According to Ross, many estuaries with large tidal ranges are highly turbid – meaning they're murky with a large amount of suspended sediment. The turbine farms will affect where the sediment will ultimately be transported. Her model can predict where sediment would deposit. For example, if the accumulation would cause an underwater mountain to obstruct a navigation channel, farmers will have to decide whether to move the farm or prepare for the need of dredging more frequently in those areas. Ross believes her research is unique and is enthusiastic about using her models to engage her students. "I use models like this to teach hydraulics and show undergraduate students what coastal engineering is all about," said Ross. "This is a really cool application and they get excited about it." She can develop similar computer models that can be applied to estuaries around the world. 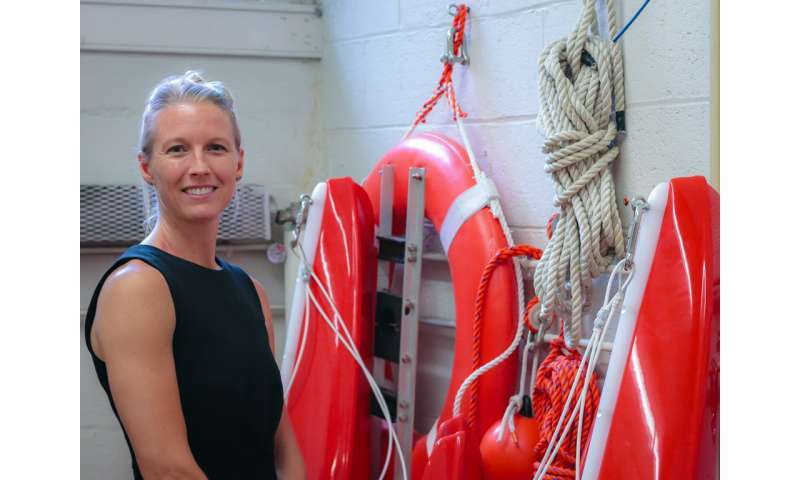 She is eager to collaborate with tidal turbine farmers in Maine and beyond. "With the current state of our climate, we need to focus our methods for generating electricity away from fossil fuels," said Ross. "I think tidal energy is one of the most promising ways we can do that in the future."